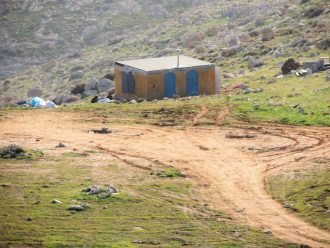 In recent weeks, settlers have reestablished the illegal outpost Tekoa E. Two buildings have been erected so far and a number of young men and women are on the spot. The outpost is located two kilometers south of the Tekoa settlement in the area run by the Gush Etzion Regional Council east of Bethlehem. In the past, a road was opened at the point where the outpost was built from the nearby Tekoa D outpost, and today, too, it is used by the settlers to reach the site. Although the outpost was evacuated in the past, it was rebuilt. This is the second time that settlers have tried to establish this outpost. It was established for the first time under the auspices of the Gush Etzion Regional Council after the abduction and murder of the three youths in the summer of 2014. At the time, the Council set up a number of caravans in the illegal outpost, but after a few weeks the settlers evacuated the area after reaching an agreement with the defense minister in return for a plan that would approve and retroactively legalize neighboring Tekoa D, according to media reports. It was also reported that the defense minister promised the settlers that in return for evacuating the outpost he would approve the construction of a farm in Tekoa E.
In March 2013, the Blue Line team of the Civil Administration completed the work determining that the area on which the Tekoa E outpost was built was considered “state land.” However, the area of the outpost was not included in the jurisdiction of any settlement, as was the adjacent outpost, Tekoa D. The establishment of the Tekoa E outpost in the last few weeks joins a number of new illegal outposts that have been established over the past twelve months. For more details about the previous establishment of the outpost, click here.